U.S. Coast Guard 17th District Alaska Aug 13, 2018. KODIAK, Alaska – Two Coast Guard Air Station Sitka MH-60 Jayhawk helicopter aircrews, Alaska State Troopers personnel, a canine search team, and two ground teams are searching for a 74-year-old man in a heavily wooded area approximately 28 miles northwest of Haines, Alaska, Sunday. 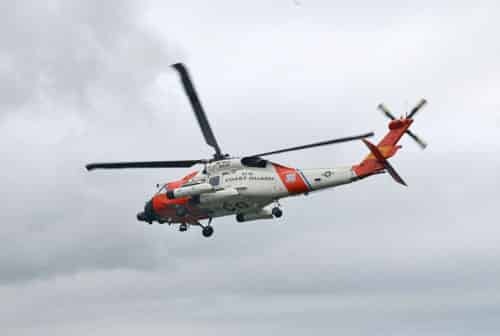 Coast Guard aircrews and three canine search teams from Skagway, Juneau and the local Haines area are searching by air and land to saturate the wooded area he is suspected to be in. He is reported to have been last seen at his residence at 10:30 a.m., wearing jeans and a blue and white long sleeve button–down shirt, Friday. His vehicle was located, parked and unoccupied, on a remote road at 6 p.m., Saturday. The man has no reported medical issues or mental instability. Saturday night, at approximately 9:31 p.m., District 17 command center watchstanders received an agency assist from Alaska State Troopers for a helicopter assist due to the inability of local ground searchers to access the heavily wooded area after sunset. District 17 command center directed the launch of an Air Station Sitka MH-60 Jayhawk helicopter aircrew to conduct the search. The Jayhawk aircrew conducted a one hour search utilizing night vision goggles, forward-looking infrared radar, and a spot light. A secondary flight was conducted Sunday afternoon.